Remnant: ... But Wait There's More! ... But Wait There's More! We have been continuing to work at our usual breakneck pace and just got a bunch more projects finished and put in to Hawthorne Vintage. Here they are! On Tuesday I drove a couple hundred miles looking for stuff and came home with this wonderful Heritage Henredon cocktail table. 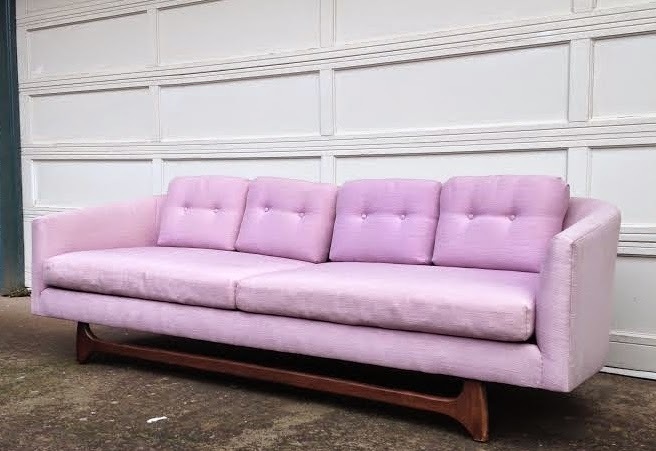 Before & After: I picked up this sofa last weekend. Someone had tragically recovered it in this awful fabric. We updated it with a modern grey fabric. Baumritter pod sofa. Reupholstered and on sale for just $895. I also found this round lane acclaim coffee table on my buying trip on Tuesday. A few weeks ago I bought this sputnik chandelier for our new house. We have decided to go with a George Nelson bubble lamp instead. I am sure it will find a good home.